Each week, my children receive a small allowance. It’s not tied to any chores; instead, it’s mostly a tool to teach them about money management. We pay them in quarters, with each child receiving twice the number of quarters as their age. So, a five year old would receive ten quarters, a three year old would receive six quarters, and so on. When each child has turned four, we’ve started having them segment their allowance into four different groupings. At a minimum, they’re required to put one quarter in each of the four segments (after age eight, two quarters is the minimum). The four segments are spending, saving, investing, and giving. The spending segment is just like it sounds: they can spend it on whatever they like, within reason. This money goes for short term wants like trading cards or other such things. The saving segment involves them picking a specific savings goal, then putting aside their money in that segment until they have enough to buy it (usually along with money in the “spending” segment). This usually ends up being savings for a larger toy, like a Nintendo DS. The investing portion is a long-term savings that won’t be touched until they’re at least sixteen, but with it they get to see the power of long-term saving and compound interest. So far, we’re just letting this segment build and talking about how much is in there, but eventually we’ll put it in a bank and perhaps invest it in other things. The giving portion is just that: it’s given to a charity of their choosing once a year or so. We like to focus on charities where they can, in some direct way, see the good their money is doing, but they have the final decision about what charity to aid. We usually present several options to them, talk about each one, and they choose one. 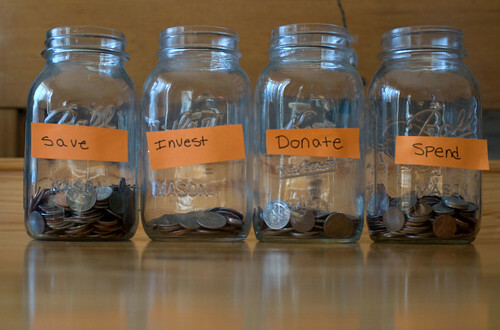 We’ve been using the Money Savvy Pig for this separation (it made for a wonderful fourth birthday gift for our oldest and our middle child), but you can certainly replicate this scheme with four jars. You can also make up your own divisions and assign your own rules to it – whatever works for you. The reason behind giving an allowance and segmenting is because, in the end, this is a budget. Segmenting an allowance means budgeting. They’re learning that when their income comes in, there are good reasons to split it up and to save some of it for the future. You should spend less than you earn in any given week, because if you do that, you’ll have money for other things later on. This technique lets children see personal finance at work in a very tangible way in their own lives, which is the best way to make it real for them. There’s no abstraction at all. They feel the physical quarters, they see them in the jars, they get to make the choices as to how to spend them, they see the benefits of those choices. Not only that, it gives you (as a family) an opportunity every week to talk a little bit about good personal finance practices, and that little chat can often be just as much of a motivator toward good behavior for the parents as it is for the children.